It’s a new era for DJs! With the PT01 Scratch portable turntable, you can scratch and cut—anywhere. Built with Numark’s exclusive Adjustable Scratch Switch™, PT01 Scratch enables you to grab your favourite scratch record (not included) and perform any turntablist scratch routine, whether you have access to AC wall power or you’re outdoors with your friends. Keeping fresh with a dope new paint job, PT01 Scratch is designed for any DJ that is passionate for the art of turntablism and enjoys digging for vinyl records. There’s an Adjustable Scratch Switch™ that gives you the perfect way to scratch, plus it’s adjustable for either right-handed or left-handed scratching styles. You can simply unscrew the scratch switch and adjust it to your style. Our scratch and slide switch performs longer than ordinary faders, plus, unlike others, it’s user-replaceable. 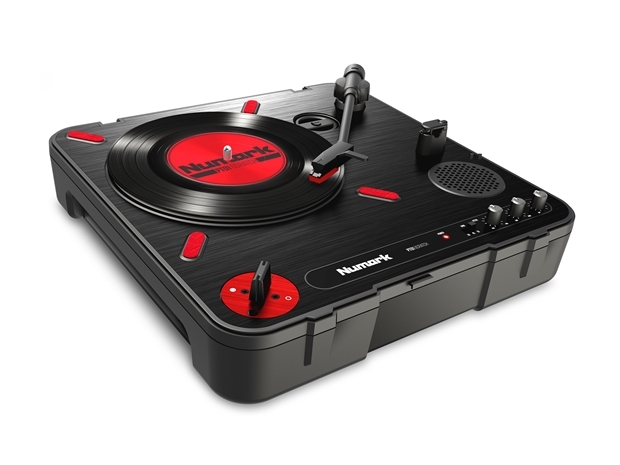 PT01 Scratch comes equipped with a red slip-mat to perform light to heavy-handed scratches with your scratch records. Connect your phone or any audio source to play a background beat through the 1/8” stereo input and scratch along to the beat. Increase the volume with the gain control and play it loud and strong on the built-in speaker. You can also connect PT01 Scratch to other equipment via the RCA stereo outputs or use the headphone output for private listening. Record digitally to your laptop In addition to scratching and having fun, you also have the capability to record your vinyl digitally via USB to your laptop (with free downloadable software). 1/8” Aux input with adjustable volume.